A 'New' Irish Recipient of the Medal of Honor Discovered? As recent posts indicate, I am currently in the process of conducting extensive research into Irish-born Medal of Honor recipients from the American Civil War. Research work in the United States has added a number of names to the ‘Irish-born’ list, and I would like to put forward a further name that I feel may merit inclusion. This would bring the number of confirmed Irish-born recipients of the Medal of Honor from the American Civil War to 146. Examination of Horan’s Muster Roll Abstract confirmed his roster details, most crucially his age and enlistment location- Dunkirk, a city on Lake Erie in Chautauqua County, New York. A review of the 1860 Census for Chautauqua County to examine likely candidates revealed two Thomas Horan’s living there that year. The first lived in the right city, Dunkirk, but was 28 years old at the time of the census, which does not tally with the details for the Gettysburg Medal of Honor recipient. However, the second Thomas Horan, also a resident of Dunkirk, provided much more promise. On 2nd July 1860 the census enumerator visited the household of Michael Horan, a fifty-year old laborer, and his forty-year old wife, Mary. Michael had a large family of seven children; four-year old Anna, nine-year old Andrew and eleven-year old Dennis- all of whom were born in New York- as well as thirteen-year old John, fifteen-year old Michael, eighteen-year old Patrick, and the eldest, twenty-year old Thomas. All of the latter children were born in the country of their parents, Ireland. The twenty-year old Thomas is listed as a laborer like his father, and is the only individual who matches the age and location profile for the man who would go on to receive the Medal of Honor for his actions in 1863. 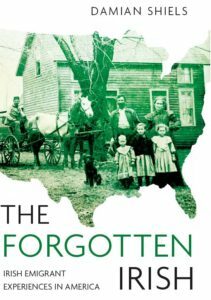 The birthplaces of the Horan children suggests that the family emigrated to the United States in the late 1840s, most likely between 1847 and 1849, making the Famine the most likely cause of their departure. The surname is most often associated with Galway and Mayo, and it may well be that they hailed from Connacht. More work is needed on Thomas Horan, but there is strong evidence to suggest that he is indeed the 145th Irish-born man to be identified as a recipient of the Medal of Honor for his actions in the American Civil War, and that he increases to six the number of Irishmen who earned the honor at the Battle of Gettysburg. Your right he is a Monaghan native, he was number 144 on my list- I think there are a few more lurking out there as well, it would be nice to tie them all down! I was unable to locate access to websites with Ohio 10th OVI company H . His name is Thomas Leddy (LIDDY) whichwas the Irish Company. I was unable to locate a printable page. A website require a membership. I have tracked down his pension index card, which should allow you to request his pension file from the National Archives which should contain a good bit of information on him. 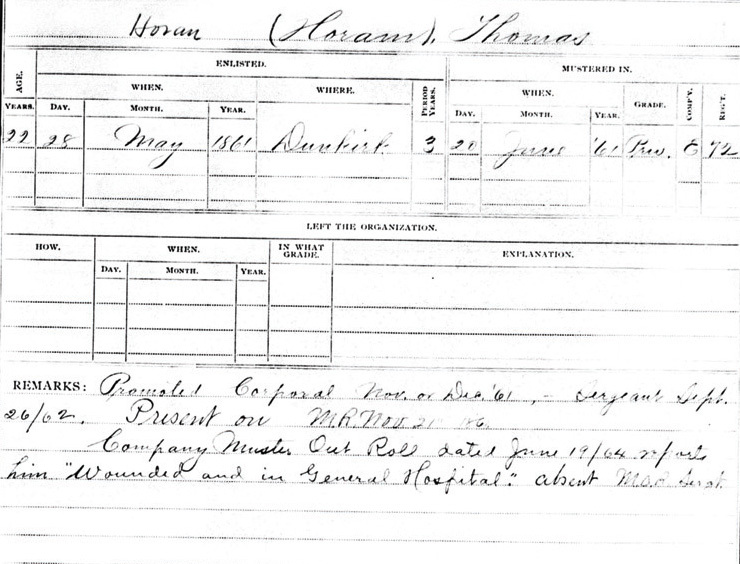 He is listed as serving in Company H, and his pension was filed on February 18th, 1886. His application number was 562,807 and Certificate Number was 402,692. In it he is listed as ‘Thomas Liddy’. Let me know if this is of any use, and if I can be of any further help let me know! I would hate to think we left anyone out.Such a list would help other counties honour their dead heroes. Absolutely right. There needs to be a lot more work on the Irish recipients, as we don’t know even the county of origin for the vast majority. There is certainly room for a major project looking into all their stories, I have only been able to look at small numbers thus far. The Peace Park is a superb initiative and a credit to all involved. Many thanks for taking the time to comment! Me again Damian, you should ask the Minister for Arts, Heritage and the Gaeltacht for assistance in your work, they should finance any research. We have been in touch with them alright, they did mention our work though we weren’t able to get any financial assistance towards a conference, which was a pity. Still, hopefully something we can achieve in the future! Hello Damian, sorry for the delay in responding to your last two emails. For some unknown reason they were in the spam mail section. No problem John! I don’t think he is a relation, all my family are from Limerick, but somewhere down the iine he must be!